More than just a way to get a ticket, a missing headlight is dangerous, too. Lack of visibility on the road is a major contributor to accidents and other vehicular damage. While the stock headlights on your vehicle will get the job done, for the best possible illumination on the road you’ll want to consider an upgrade. What are the Different Types of Car Headlights? Do LED Headlights Have Any Disadvantages? 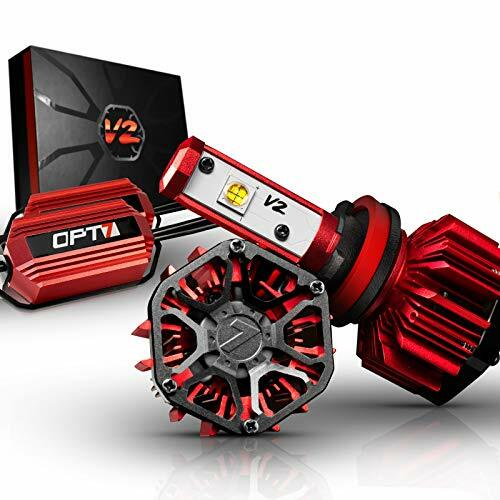 Brilliant, long-lasting illumination backed by a three-year warranty and lifetime support from Cougar Motors. 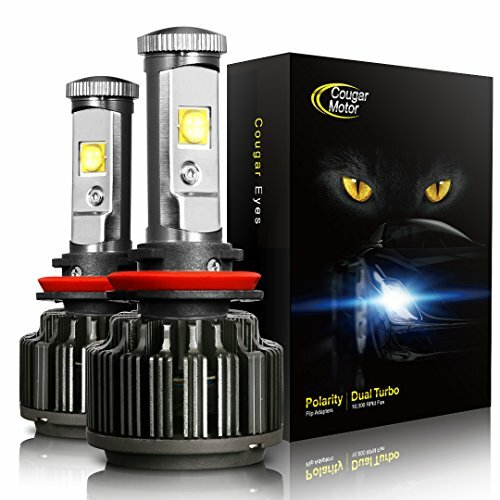 These LED headlights from Cougar Motors pack a lot of punch with high luminous efficacy flux up to 7200LM per pair. That works out to illumination which is about 200% brighter than typical Halogen stock lights. At the same time, these LED bulbs stay cool inside an aluminum housing with a 10,000 RPM TurboCool fan. Installation is usually pretty simple even if you’re not mechanically minded. Plug-and-play design with CanBUS-Ready bulbs means your vehicle’s computer system will instantly recognize the new bulbs. Total bulb life is over 50,000 hours. 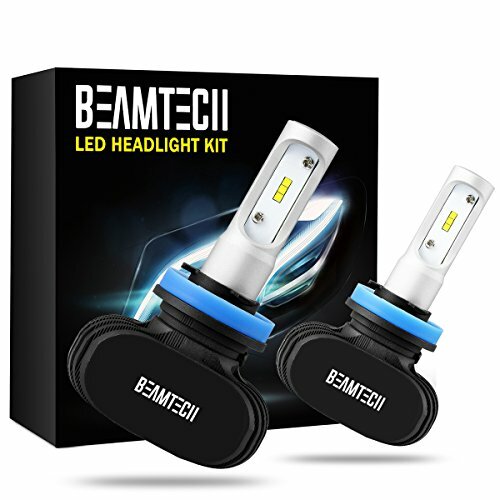 These LED lights from Beamtech produces a bright, even beam of light while preventing overheating with silent, passive cooling technology. The cooling technology in many cheap LED lights often produces an audible rumbling noise which can be heard inside the car. Beamtech prevents that annoyance with whisper-quiet passive cooling features which don’t sacrifice illumination. CSP double-sided LED chips produce an 8000-lumen output, which creates a wide strip of light able to cut through the cloudiest and darkest conditions. Easy plug-and-play installation requires no complicated fan setup or use of high voltage connections. Lights are also waterproof. Although small in size, these headlights pack a powerful light pattern with no shadows or dark spots. These are some of the smaller headlights on the market, making them perfect for compact cars and other vehicles without much front room to spare. The 6000LM lights are great for everyday driving but can also work effectively as fog lights. At the same time, the 6000K Xenon-white bulbs don’t produce glare and won’t blind other drivers. All of the advantages of HID lights with none of the disadvantages. Easy plug-and-play installation. Small, simple and powerful, these LED Headlights have efficient cooling with a full beam pattern. 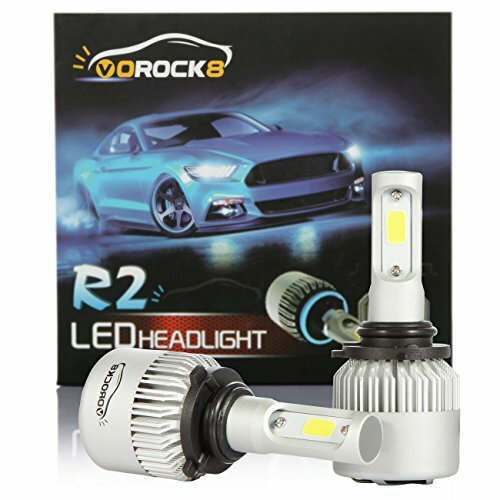 With light output capable of reaching 4000LM per bulb, these LED headlights from VoRock8 use Bridge Lux Chip-COB technology which is perfect for cutting through the dark. These lights are rain resistant, waterproof and designed for rough weather. Heat dissipation is top-of-the-line thanks to a built-in Japanese two-ball fan cooling system. Installation is simple plug-and-play, although some high-powered cars will need a canbus decoder. A clear, powerful beam of light protected by solid aluminum with enhanced cooling features. These Fluxbeam LED headlights have a clear arc-beam with 3,500LMS per bulb, with no dark spots or glare. Cooling features include a TurboCool fan and RedLine driver which help the bulb last over a whopping 50,000 hours. CREE MK-R LED and Arc-Beam technology create a solid lighting pattern to the front and sides of the vehicle. Can be used as headlights, low beams or fog lights. Plug-and-play technology allows for fast installation. Plus, all lights include a two-year warranty as well as lifetime support from the California-based OPT7. 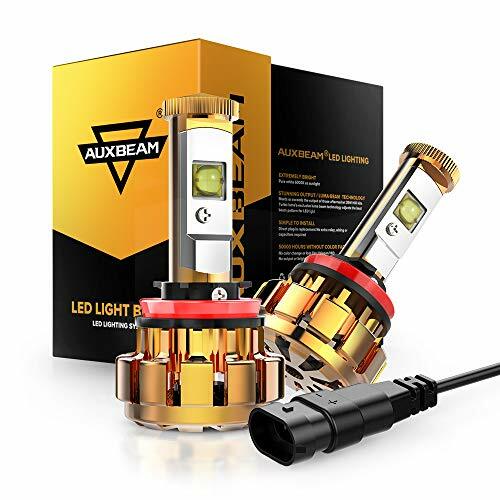 Auxbeam is a trusted name in car lighting technology, and their F-16 series of LED headlights are bright, durable and have an efficient cooling system. These single-beam headlights are each powered by CREE chips with a luminous flux of 3000LM per bulb. The 6000K is bright enough to light up the entire road but won’t stun passing drivers. Can be used as either headlights or fog lights. The white light reflects against road signs and paint. A built-in turbo fan and aerospace aluminum alloy keeps the lights roughly 30% cooler than standard headlights. Waterproof and dustproof IP68 seals make these lights a great choice for harsh outdoor environments. Car headlight technology has advanced tremendously in a relatively short period of time. There are more options for different types of headlights than ever before. Standard headlights will certainly illuminate the road, but better and brighter options are often available. Halogen, HID and LED are the three most common types of headlights. These are the most common types of headlights and are typically standard on most consumer vehicles. They use a heated tungsten filament to produce light, similar to how the lights in your home function. But this type of light also produces a fair amount of heat and skin moisture. Halogen bulbs are relatively inexpensive and tend to last for a long time, but they provide the least illumination of the three headlight types. They’re also not ideal for fog, rain and excessively dark conditions. Also called Xenon lights, High-Intensity Discharge lights are much brighter than Halogen bulbs. HID lights are those super-bright blue-white headlights which light up the road – and have probably lit up your rearview mirror on occasion, too. Xenon lights require a burst of power when first turned on, but they use very little energy to maintain brightness. They’re far more energy efficient than halogens. The downsides are an increased cost per bulb compared to halogen, plus HID lights can definitely annoy other drivers. LED headlights are the newest type of headlight. While they’re not as well-known as HID and halogens, LED lights are quickly growing in popularity because they have many unique advantages over other headlights. LED technology uses small, light-producing diodes when stimulated by electric current. Unlike gas or filament-based lights, LED lights require only a small amount of power. Plus, LED lights are significantly brighter – up to 200% brighter or more – than other vehicle headlights. These light emitting diodes are small, so they can be formed into almost any shape. This is especially helpful when dealing with any cramped light arrays found in the front of smaller and compact vehicles. Multi-colored LED lights are also used to create light strips and other design patterns on vehicles. Additionally, LED lights are directional while halogen and HID diffuse the light. This means LED lights are able to provide a clear beam which can cut through fog, rain and moonlight-free darkness. Cost and heat are the two major disadvantages of LED headlights. However, solutions for each are available. First, LED headlights do cost more than halogen and HID lights. 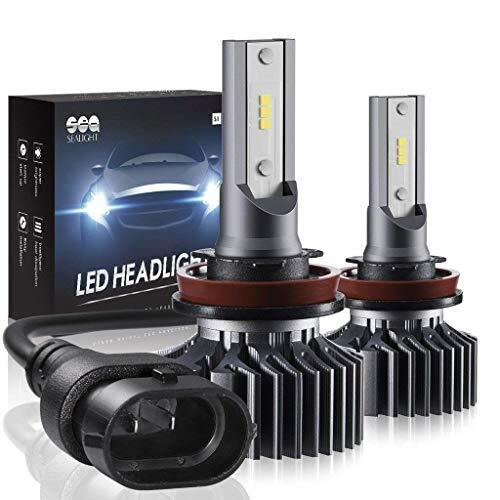 Exact prices will depend on the number and complexity of the individual diodes used in the LED headlight, but prices can exceed 10 times halogen bulbs. However, that’s not really the full story. Halogen headlights can last for a reasonable amount of time but LED headlights will last much, much longer. Some LED headlights will burn bright for anywhere from 10,000 to 30,000 hours and even more. In some cases, LED headlights will outlast the car they’re installed in! So, while the initial costs are higher, LED headlights are often the more economical choice in the long-run. Additionally, LED lights can get hot even after short periods of use. All LED headlights will include some type of cooling system. Most systems will consist of a high-powered cooling fan as well as aluminum housing to act as a heat sink. One side effect to watch out for is fan noise. Cheaply made LED headlights will often have a loud fan in the cooling system which you’ll be able to hear inside the car. You’ll want a well-constructed fan which operates at a quiet level. Certain passive cooling systems, which don’t use a fan at all, are also available. LED headlights clearly provide more visibility than any other type of headlight. The beam pattern will be crisp, bright and free from shadows. At the same time, LED lights are designed to eliminate glare. You won’t be blinding every driver you pass. LED headlights have no bulbs, filaments or electrodes. This means they’re unlikely to break even when driving in rough conditions. LED headlights are ideal for any vehicle which frequently drives across rough, bumpy and rugged terrain. Many off-road and industrial vehicles use LED headlights because of this durability. As discussed above, LED lights are typically purchased just once (barring any serious accident or damage). The average LED headlight is equivalent to 50 Halogen headlights or 20 HID lights. Over 72,000 accidents are caused each year by drivers who fall asleep at the wheel. In a weird twist, many traditional headlights are actually contributing to driver fatigue. Our body’s internal clock is regulated by the color temperature of the light around us. The color temperature of traditional headlights actually mimics those of a sunset, and our brains interpret this light as a signal to sleep. LED lights have a color temperature similar to midday sunlight. This light helps the brain feel awake. If you frequently drive during the night, LED headlights can actually improve your reaction time and overall alertness. Many people simply stick with whatever type of headlights came with their car. But that can be a mistake. Brighter, safer and more cost-effective headlight options are available. LED Headlights light up the road and allow you to spot potential dangers even in dark, foggy conditions. Plus, unlike Xenon headlights, LED headlights have no glare and won’t blind other drivers. Although the initial cost can be higher than other types of headlights, LED headlights typically last for over 10,000 hours, making them an economical choice. Don’t let poor visibility put you in danger on the road. Choose a pair of bright LED headlights to increase your safety when behind the wheel.